With more money coming into the game of rugby union than ever before, coaches and players have never been under such pressure. Although not quite at football-type levels, sackings certainly do happen, while many players live on a constant tightrope, hoping they have done enough each season to earn another year or two on the contract. The same applies to referees, who have seldom been under more scrutiny. The laws are constantly being tinkered with, television producers pore over every contentious decision, while teams prepare for different referees in different ways, doing anything and everything they can to tip the balance in their favour. It has never been harder to be the man in the middle. It is perhaps not surprising then that, apart from the former Saracens fly-half Glen Jackson, who took up refereeing full-time in 2010 and a year later was taking charge of international matches, the number of professional players who have turned to officiating is tiny. Jackson remains the only player to play professional rugby at the top level, and then officiate to the same standard. Why is this the case? 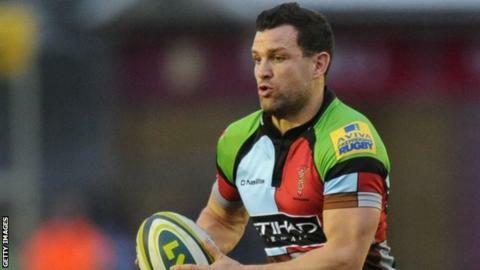 It is a question I put to the Harlequins and England scrum-half Karl Dickson - a man who is looking to buck the trend. Dickson started refereeing in January and has already been fast-tracked through the amateur levels. "I don't really know the answer to that," he told BBC Sport. "I'm guessing some people don't see it as a lucrative job. "Some people want to go into business, while other guys maybe feel after 15 years playing rugby they want to leave the sport behind and move on." Despite some outstanding refereeing displays at the back end of last season - notably JP Doyle in the Premiership semi-final between Northampton and Leicester - there were also some unsavoury incidents involving officials. Referee Tim Wigglesworth had a plastic bottle thrown at him as he was escorted from the pitch following ill-tempered West Country derby between Gloucester and Bath in which two players were sent off and five were sin-binned. And Dickson thinks that players, and supporters, will instinctively have more respect for a referee who has played the game at the highest level. "I believe the more former players we can get into refereeing, the better the refereeing is going to be," the 32-year-old continued. "I've got a lot of stuff to work on, but you can't say to someone who's played the game at the highest level 'you don't know what you are doing'. "How can you referee a game you've never played? Obviously guys learn, but the best learning experience is being involved. That's where I feel my expertise is going to be, especially being a scrum-half and always being in and around the breakdown. "The more people we can get into it, the better the game is going to go, and the less whinging we might have about refereeing." The Rugby Football Union's head of professional game match officials, Tony Spreadbury, agrees. "We want to encourage any ex-player to take up the whistle, because their game understanding is high up there, while their fitness is readymade," he says. "We will have in place a shortcut to the senior level, there is no doubt about that." Spreadbury also says the salaries on offer to the nine RFU full-time referees are "competitive", while it is understood salaries could also be negotiated - if needed - to ensure a former player is not put off. "It's something that I actually enjoy," explained Dickson. "I never thought I would do, but since signing up I've thoroughly enjoyed it. "I'm looking forward to following it through into this season and going through the levels, and hopefully at the end of my playing career it's something I can potentially hit the ground running with and get straight into. "I've got guys behind me like Howard Jones [Dickson's personal refereeing mentor] and Chris White, while Wayne Barnes [the latter two both international referees] has been down to see me. "They see someone who has played the game and they want to push me through as quick as I can, because they want a guy who has played the game at the top level to be involved in it. "They've given me a lot of help, after each game some feedback and constructive criticism, and areas I need to work on." Rugby careers can be painfully short, as the number of premature retirements testifies, and Dickson says he sees refereeing as an ideal way to stay connected to the game. "A rugby career doesn't last forever, and when you get into your late 20s you've got to really start thinking about what you do after rugby, and the options you have," he said. "I have a degree, but it's something to keep you in rugby; I love the sport, I love the game and it's something to keep me involved and hopefully progress forward in the future." However, with top-level referees required to be at peak mental and physical fitness, it is crucial that players do not leave it too late - which is why Dickson will look to have about five years of refereeing experience behind him by the time he retires from playing. "The RFU are working around my schedule," he said. "If I play on Friday night I can referee Saturdays or Sundays, and vice versa. They can then look to see which games suit me and will test me to the best of my ability." Barnes, one of England's leading referees who is also on the International Rugby Board referees' panel, says Dickson has what it takes to referee at the highest level. "Karl has done extremely well," he said. "He has a lovely rapport with the players, he stands where a scrum-half stands so is right on top of the action, and the players respond to him. He has that automatic credibility." And Dickson sees no reason why he we will not be able to referee at the very top, and follow in the footsteps of Jackson. "That's the aim. I still feel I have a good three years in me as a player," he said. "It's just about progressing through the levels as quick as I can, so when I do finish playing I can go in and referee Premiership games, and obviously the ultimate goal to referee international games on the biggest stage."